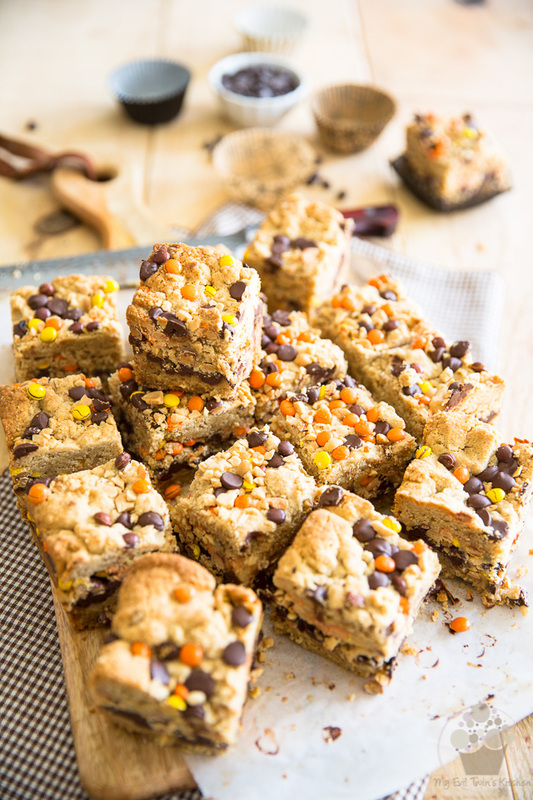 Soft, crumbly, melt-in-your mouth delight, these Peanut Butter Chocolate Oatmeal Bars are a total peanut and chocolate goodness overload. A PB lover’s dream! I hope you like peanut butter ‘cuz I’ve been on this insatiable PB kick lately and it just doesn’t seem like it wants to die out. I’ve even dedicated an entire board on Pinterest to my love for the thing and I’m seriously starting to consider giving it its own category on here, as it feels like 8 out of 10 inspirations that I get in the kitchen involves the use of peanut butter in one way or another. 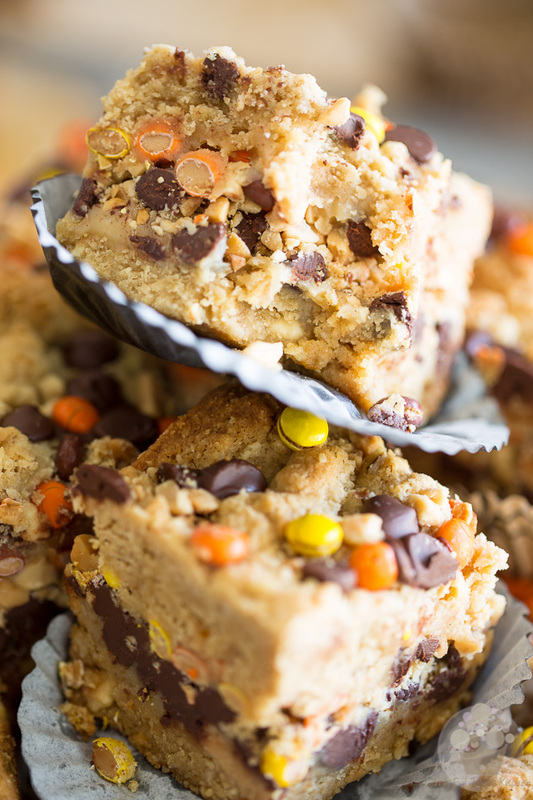 And now, these Mini Reese’s Pieces Peanut Butter Chocolate Oatmeal Bars, loaded with peanut butter, peanuts, Reese’s pieces and chocolate. That’s like peanuts overload to the 10th power! 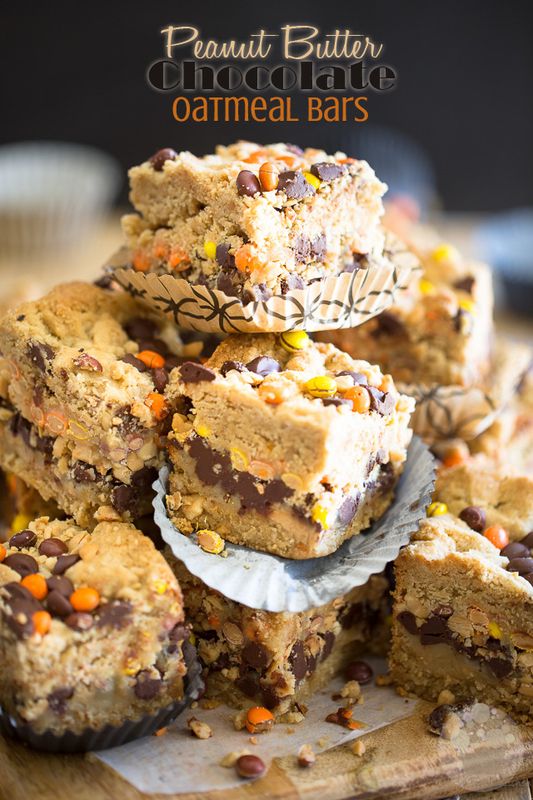 Oh, and I also have a Peanut Butter and Chocolate Rice Krispies Treat recipe in the works. Oh yeah! At that rate, I think we can almost call it an obsession. Perhaps I oughta see a doctor? Naaaah, I’ll be fine… at least, I think I will! 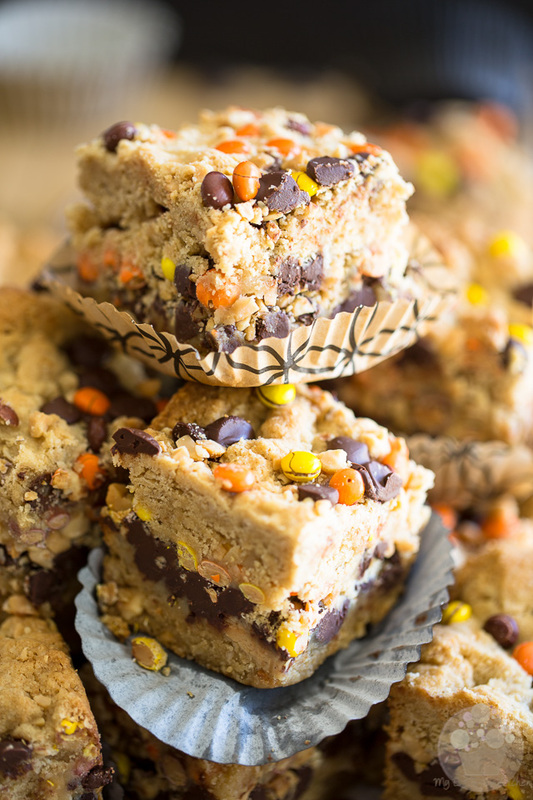 At room temperature, these cookie bars are like outstandingly soft and melt-in-your-mouth crumbly, kind of like a shortbread cookie that’s just out of the oven; the layer of peanut butter caramel is silky smooth and creamy, the chocolate chips are agreeably soft while the Reese’s pieces, they seem to pop in your mouth and the peanuts add a little bit of a crunch to the whole experience. 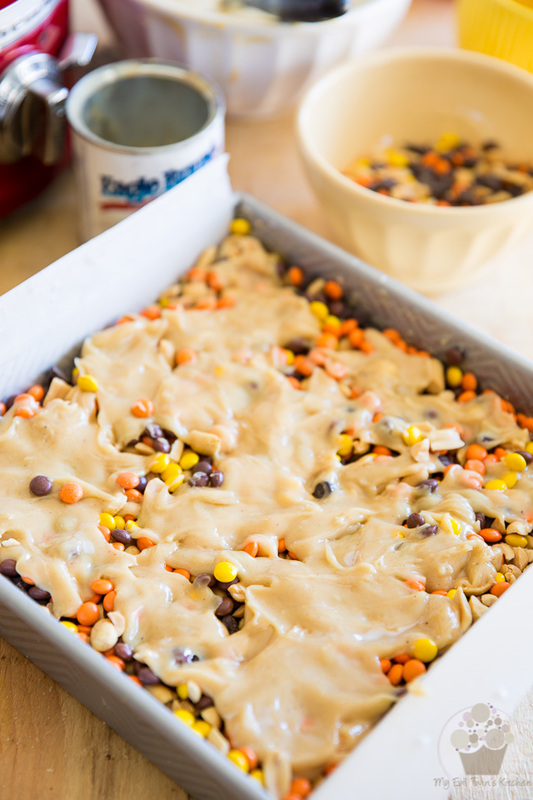 Stick them in the fridge, though, and they become much firmer, the caramel gets to be almost chewy, the chocolate chips join the peanuts in adding a bit of a crunch to the experience, while the Reese’s pieces they kinda crack and explode under the pressure of your teeth. 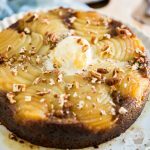 Both versions share the same freakishly awesome sweet and salty, rich and buttery taste. Honestly, I can’t decide which I like best. My solution? 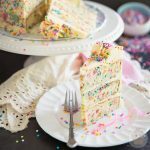 Keep half in the pantry, half in the fridge! Heat the oven to 350°F. 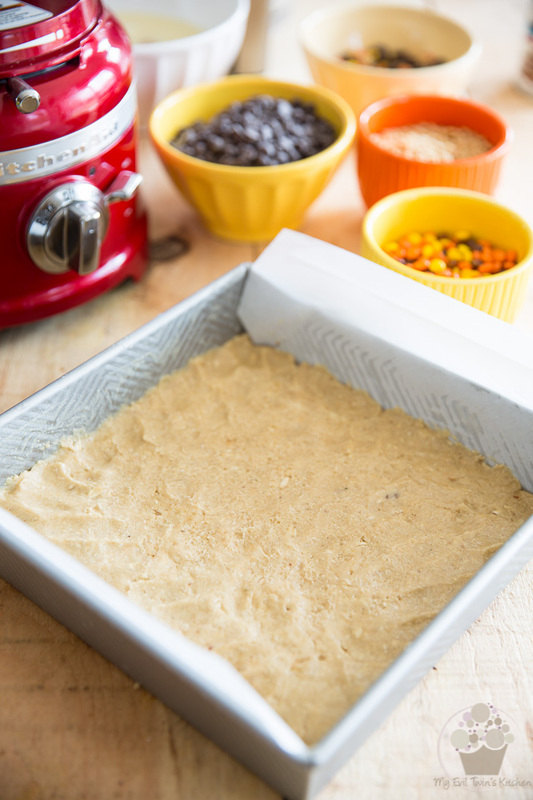 Line a 9″ x 9″ baking pan with parchment paper, leaving a bit of an overhang on either side for easy removal of the bars. Set aside. 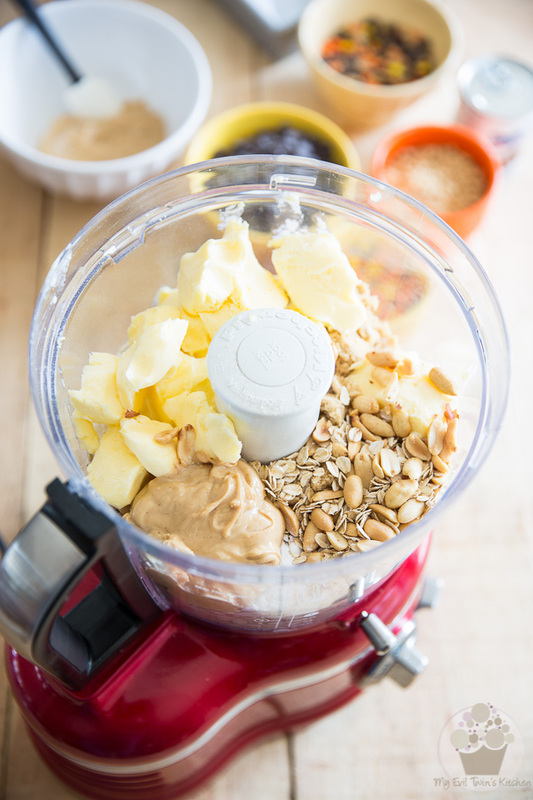 It would be a good idea to weigh and measure all your ingredients now… doing that will make your life so much easier later down the road! Process on pulse until the ingredients are well combined and have the consistency of soft oatmeal cookie dough. You can do long pulses if you have to, that’s perfectly alright. 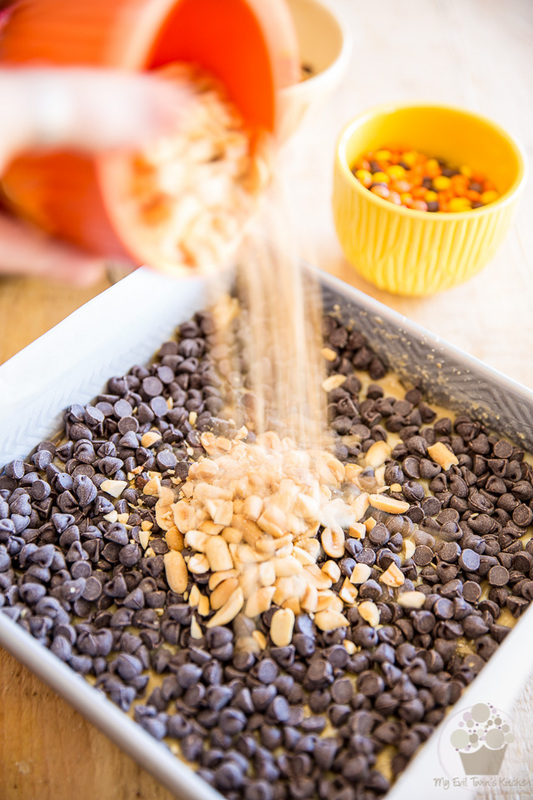 Just make sure that you don’t turn the dough into complete mush: you want there to remain small pieces of oats and peanuts. Now press about 2/3 of the oatmeal dough on the bottom of the prepared pan. Time to make the peanut butter caramel! 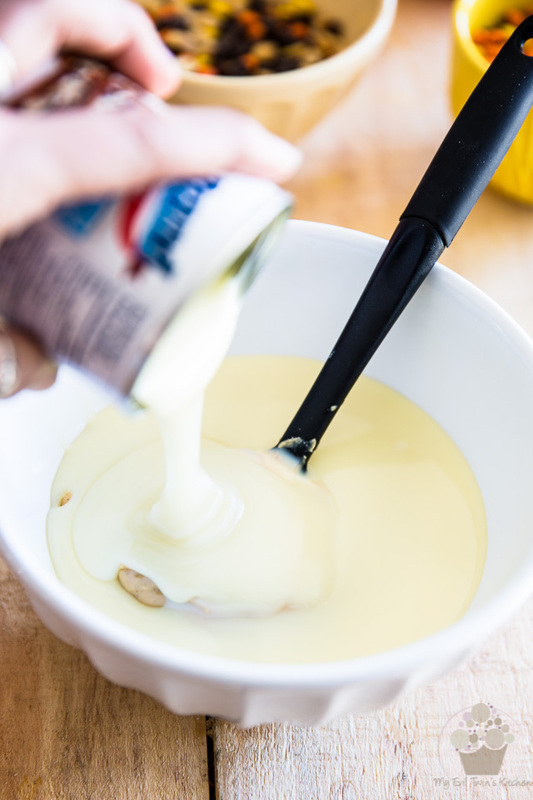 In a mixing bowl, combine 1 cup of creamy peanut butter, a can of sweetened condensed milk and 1/4 tsp of salt. Stir with a spatula until well combined and then pour about 2/3 of this caramel over the reserved cookie crust. Delicately spread the caramel all the way to the edge of the crust. If you find that it tends to stick a little too much, dip your spatula in cold water. It’ll make your life easier. 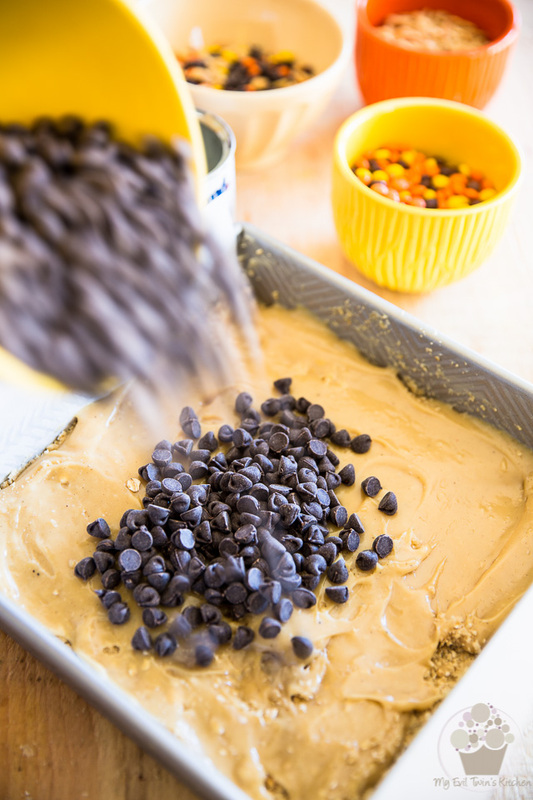 Sprinkle the chocolate chips over that layer of caramel and then spread them all the way to the edge. 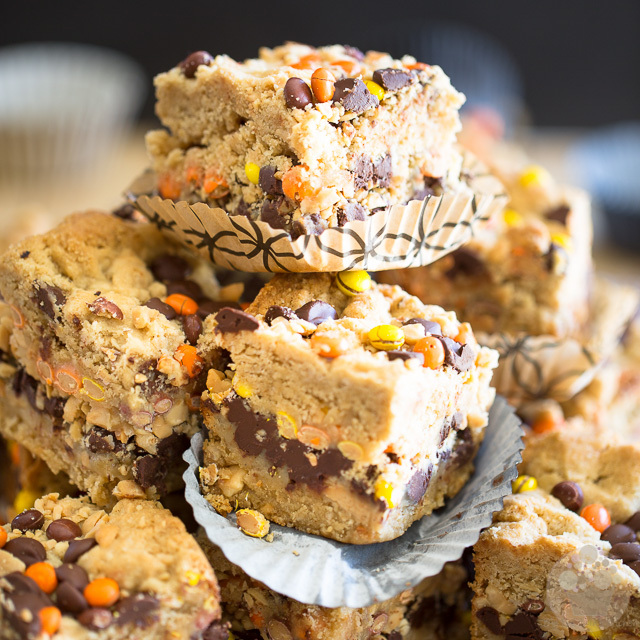 …and finally, mini Reese’s pieces. Top with spoonfuls of the remaining peanut butter caramel. 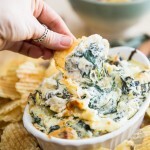 Spread it delicately across the top with a rubber spatula dipped in water. 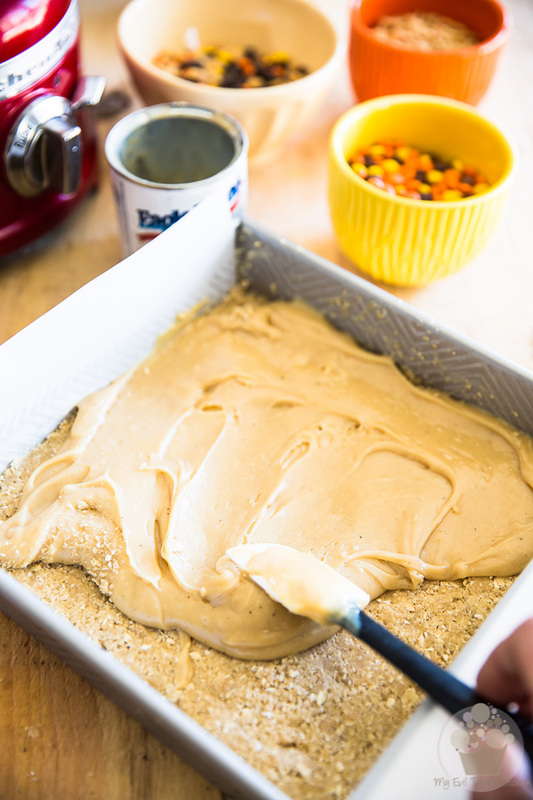 Finally, drop the remaining oatmeal dough over the caramel and spread it delicately with your fingers so it covers the entire surface of the pan. 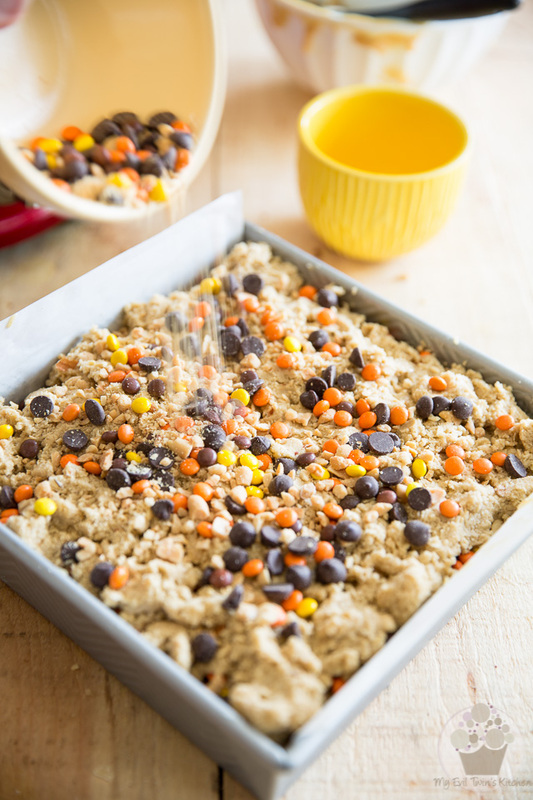 Sprinkle with the last of the chopped peanuts, chocolate chips and mini Reese’s pieces. Bake the bars for 28 to 30 minutes or until the top turns a light shade of golden brown. Cool completely in the pan at room temperature before cutting into 16 bars. Yes, that’s completely. Yes, that’s a very long time. You can do it. 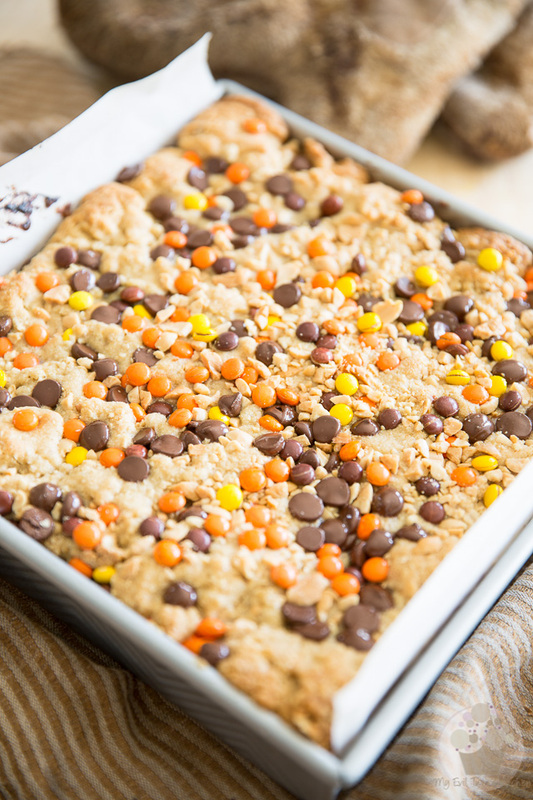 If you cut them before they’ve had a chance to cool, you’ll be looking at a crumbly mess instead of neat not-so-little squares. And now comes the hard decision: store at room temperature for soft, crumbly bars or in the refrigerator for firmer, chewier bars. Or do a little bit of both… and then you can tell me which you preferred! Heat the oven to 350°F. Line a 9" x 9" baking pan with parchment paper, leaving a bit of an overhang on either side for easy removal of the bars. Set aside. 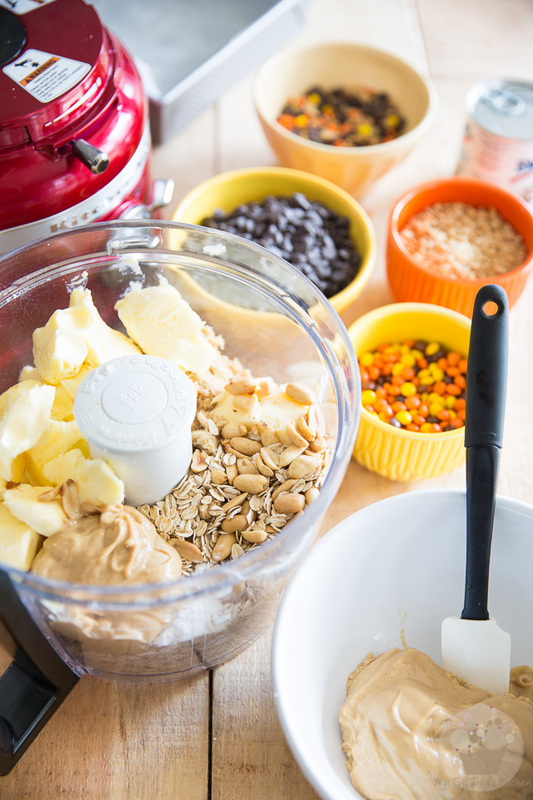 In the bowl of your food processor, combine flour, rolled oats, brown sugar, butter, peanut butter, peanuts, baking soda and salt. 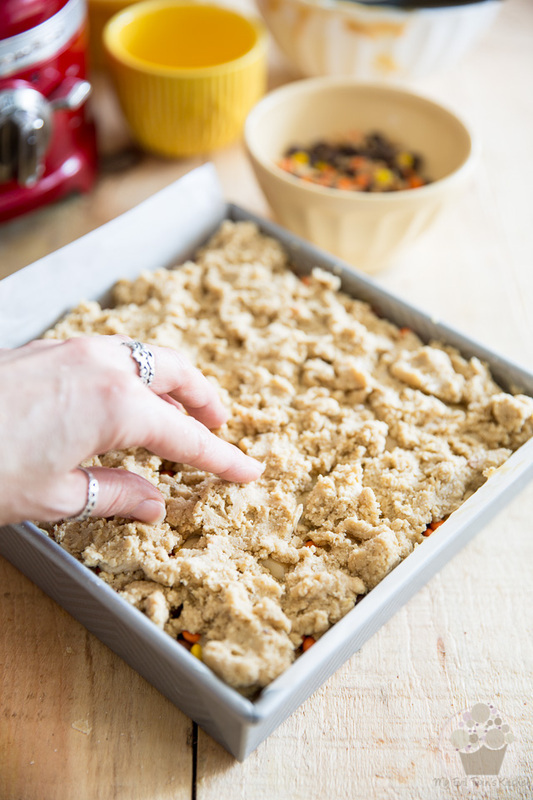 Process on pulse (you can do long pulses, that's alright) until the ingredients are well combined and have the consistency of soft oatmeal cookie dough. Press about 2/3 of the mixture on the bottom of the prepared pan and set aside. 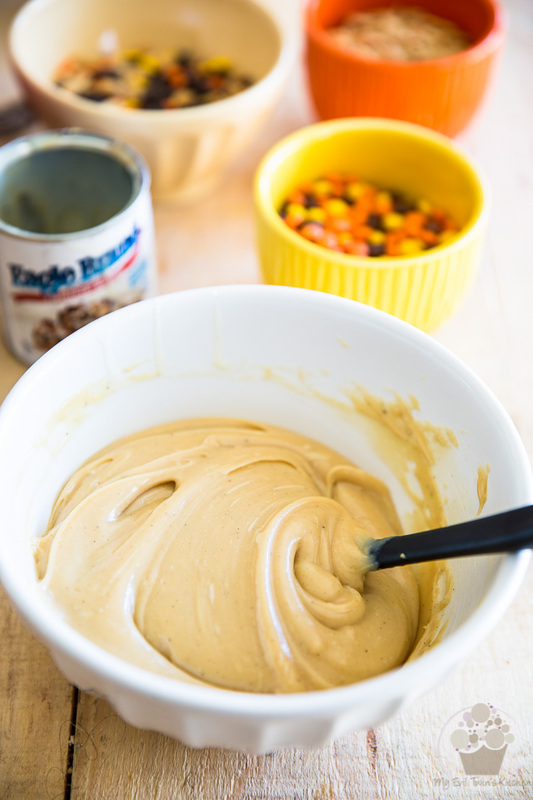 Make the peanut butter caramel: in a mixing bowl, combine 1 cup of peanut butter, the sweetened condensed milk and salt. Stir with a spatula until well combined and then pour about 2/3 of this caramel over the reserved cookie crust. Delicately spread it all the way to the edge. If it tends to stick too much, dip your spatula in cold water to make your life easier. 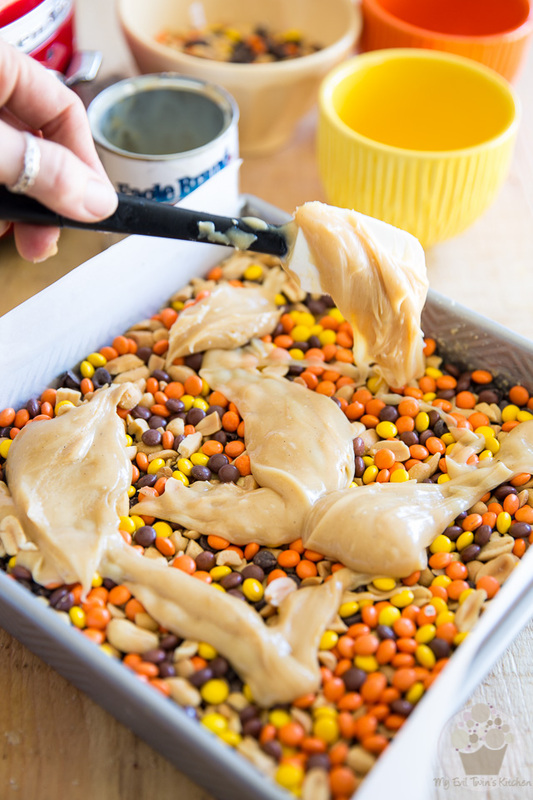 Sprinkle the chocolate chips, chopped peanuts and mini Reese's pieces over the caramel and then top with spoonfuls of the remaining caramel; spread delicately with a rubber spatula dipped in water. 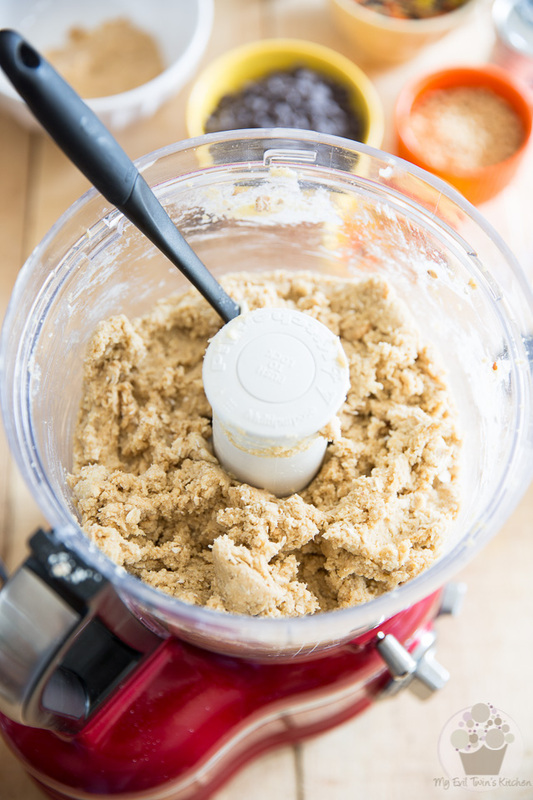 Drop the remaining oatmeal dough over the caramel and spread it delicately with your fingers if you have to. 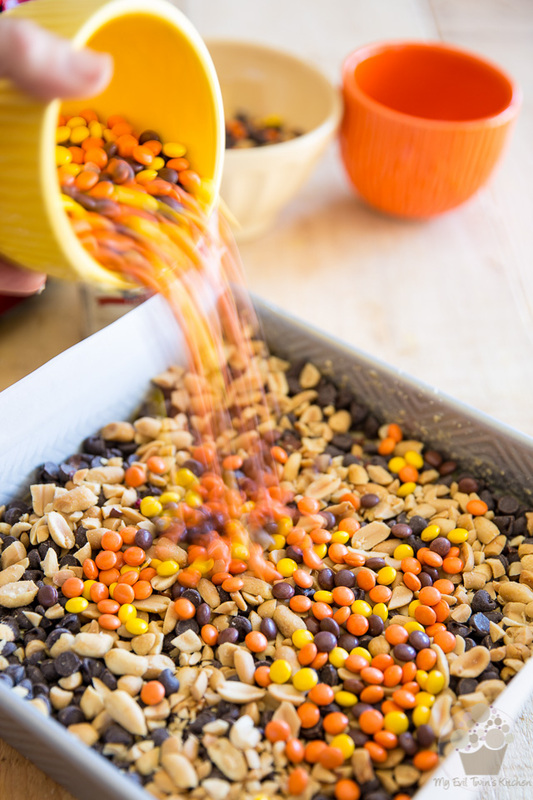 Sprinkle with the last of the chopped peanuts, chocolate chips and mini Reese's pieces. 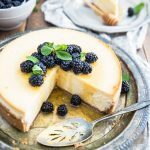 Bake for 28 to 30 minutes or until the top turns a light shade of golden brown. Cool completely in the pan at room temperature before cutting into 16 bars. Store at room temperature or in the refrigerator in an airtight container for up to a week.